Beautiful winter decoration ideas that are colorful, rich in textures and patterns add unique look and welcoming feel to your bedroom decor. Modern bedroom colors, textures and decoration patterns that reflect latest trends for the winter season fill your room with a romantic and stylish atmosphere. There are many inexpensive and attractive winter decoration ideas that help create interesting, comfortable and warm bedroom decor. Here is a guest post by Jeffrey Dixon, who studied design and fell in love with writing, that shows 6 ways for keeping your winter bedroom decor look stylish. As the chilly winter months quickly roll in and cold winter nights bombard your home like in-laws during the holidays, you may feel inclined to crawl under 50 blankets and stay there to keep warm until spring. In reality, winter can be one of the busiest times of the year and while you are working on year-end tasks, entertaining for holiday parties and decorating the house to suit the season, the bedroom decorating often gets overlooked. There are ways to stay warm and cozy without leaving your bedroom looking cluttered, crowded and outdated. Just because it is winter doesn’t mean you have to decorate your bedroom with bland, boring colors. Neon might be a spring thing but bright sophisticated bedroom colors are trending this winter. Tangerine, gold, teal, grape, cranberry and mustard yellow bedroom colors are all popular this season. Pairing a rich cranberry duvet cover with some metallic pillows or accents and a champagne pink throw will make your bedroom decorating ideas look elegant, inviting and warm. Layering these modern bedroom colors with metallics and neutrals is a way to cozy-up your bedroom decor while keeping it up-to-date. Geometric patterns are a popular to use in your bedroom decorating this winter. With color being a big player this season, using geometrical pillows or another patterned accents against a solid-color bedspread can soften the look of the room and bring all bedroom decor elements together. If you do decide to stick with neutral colors for winter, using different textures like wool, linen, wood or other natural materials can add dimension and a wintery feel to bedroom decorating. Metallic decorations are also a big hit this year and give you glitzy appeal without overdoing it. Outfitting your bedroom with a chic area rug can pull your style together and protect your feet from cold floors. Textile designer Khristian A. Howell said on HGTV.com, “Put your feet first. A dramatic and easy way to change your bedroom decor is bringing in a great rug.” Shag, sheep skin or anything with a high pile are popular this season and add extra warmth to modern bedroom decor. Layering window treatments like long, flowing drapes is a fun way to add some romantic style to your bedroom decor ideas. They also prevent heat from escaping through cracks and gaps in the windows. Most people don’t often decorate their bedrooms in winter or holiday styles because it looks cheesy, old-fashion or over the top. You can add some winter decorating themes and stay fashionable by utilizing a few select bedroom decor items. A huge trend in home decorating right now is using wall decals to spruce up a room design. These are easy-to-apply stick-ons that add artistic brilliance to your winter bedroom decorating and can be peeled off once spring rolls around. 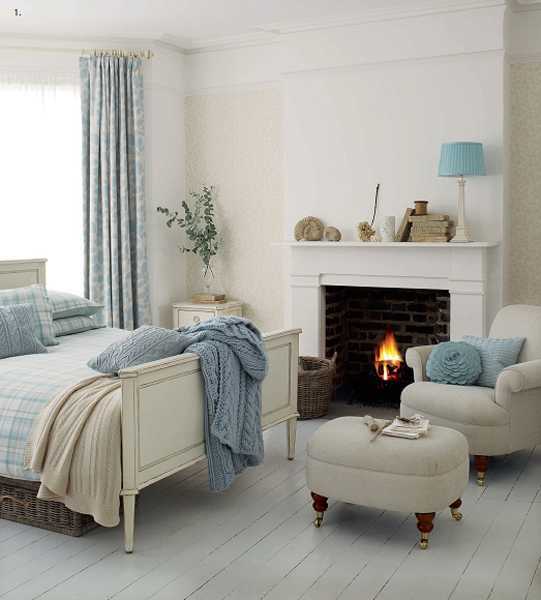 White and silver flower arrangements can make your bedroom decor feel wintery and luxurious. Placing a decorative ladder against the wall is a great way to keep your throws and blankets nearby and organize your bedroom.